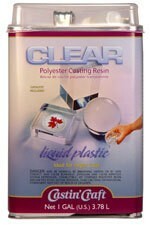 Resin casting is an exciting and fun craft that allows you to embed or encase almost any object in crystal clear plastic. Coins, shells, rocks, dried flowers, butterflies and insects are just a few of the examples of embedment possibilities. Shore D: 88, Color: Clear, Mix Ratio: Variable, Pot Life: 10 min., Cure Time: Variable. 16 oz./473ml, includes 1oz. catalyst.